For the sake of public knowledge, I thought I’d publish two recent documents, in which the Guildhall School Board acknowledges that their past conduct was unlawful, specifically, that the conflict of interest law and Vermont’s Open Meeting Law were violated. The Board, through their attorney, filed this document: Guildhall School District, Pleading to Court at Essex County Superior Court this past week. A day or two later, this statement, guildhall_written_statement_re_lawsuit was posted on the Guildhall Town website. Again, long overdue but much appreciated. 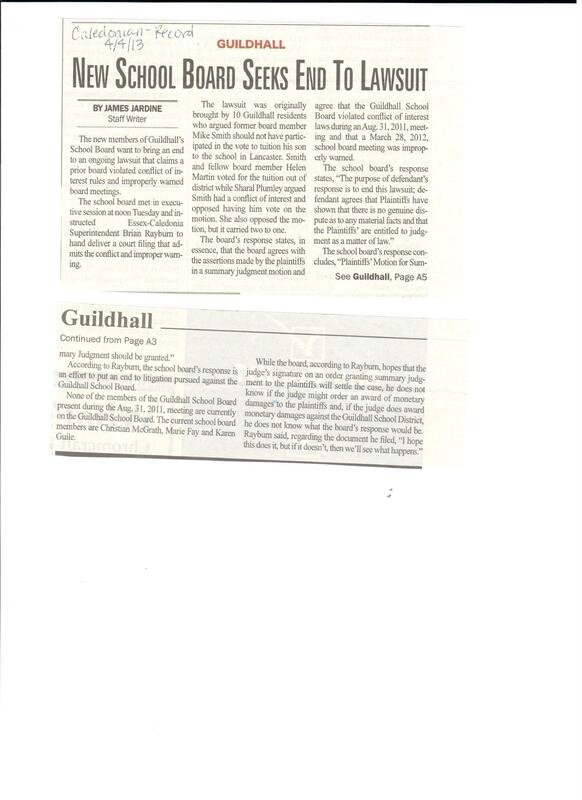 It’s been a while since I’ve written anything about the continuing saga of the Guildhall School Board controversy. But I’m now pleased to learn that our School Board has finally owned up publicly to its past mistakes. As many will remember, in the late summer of 2011, one of the then-Board members joined with the Board majority in voting to pay tuition for his own child to attend an out-of-district school. This vote happened in spite of the fact that the electorate had, just months before, said no to the tuitioning out of any grade below 6th grade. It happened in spite of a Vermont statute which specifically states that School Board members shall not vote in a matter that will benefit them financially. And to add insult to injury, that vote took place at what appeared to be an illegally called meeting, which the Board now admits was improperly warned, in violation of Vermont’s Open Meeting Law. In the aftermath of that vote, there was a groundswell of outrage among townspeople, as you might imagine. Letters were written, petitions were submitted, and citizens attended School Board meetings in record numbers to voice their concerns about the Board’s actions. Yet the School Board majority stood their ground and refused to either rescind the action or even admit error. After a slew of grass-roots activity, finally, a group of 10 taxpayers and voters filed a lawsuit in Essex County Superior Court asking the Court to declare the votes null and void. As I understand it, the lawsuit asked for no monetary damages, but simply asked that the Court declare the vote illegal and make the Board member in question pay for his own child’s tuition. In fact, many people in town, whether their names were on the lawsuit or not, felt that this was the least the Board should do, in light of the fact that so many families over the years have had to pay with their own money if they chose to send their child out of district. Today, as reported in the Caledonian-Record, the School Board has finally admitted publicly, to the Court, that the Board violated the law, as it relates to conflict of interest and Vermont’s open meeting law. (The School District’s Memorandum to the Court is available to the public at the Essex County Court). I frankly wish the School Board had owned up to its mistakes much earlier than this. If they had done so early in the game, we could have avoided much of the anger, outrage and divisiveness in our Town, and I suspect there might have been no need for litigation. In the end, it appears that perhaps the threat of a prolonged trial and the attendant publicity was enough to get the Board to finally admit error–something that was long overdue. Still, this goes a long way toward restoring confidence once again in our Board. Now that the Board has conceded that its conduct was unlawful, we shall see what remedy the Court will order. Stand by.